Finding out “Who are your best customers?” is a good start, but what then ? You need to make a decision and act, but how will you know that you are doing the right thing ? and what do you do as your next step ? Using a business analytics process will help you get answers that lead to more insightful questions and better decisions. What benefits could my organisation expect through using analytics techniques ? Retaining your best customers in all your key market segments. Understanding which customer programmes are achieving their goals and which are not ? Tailoring the types of communication used to suit what your customers desire to increase effectiveness and reduce cost. Deciding the best location for a new office, branch or store. Knowing what pricing decisions for your products or services are working well. Can any size of organisation at any stage of development and IT maturity use analytics techniques ? Analysing current information about your business or organisation. Gathering new information and improving the process. Is business analytics a new thing and is it proven to work ? 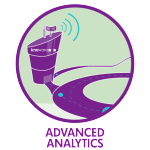 Applying analytics to business is not new, however predictive analytics is newer as is the use of new types of information such as unstructured data (text, social media). Banks and other industries have been using analytics for decades for functions such as credit scoring, operations research, and fraud detection. Analytics is about finding meaningful patterns from various sources of data to identify trends and make decisions, the effectiveness of which can then be measured and reviewed.